Opinion polls ahead of November’s presidential election contest in the United States of America are pointing to a close contest between Barack Obama and his Republic Party challenger, Mitt Romney, with an averaging out of the most recent polls, following the Republican Party’s convention in Tampa, Florida, suggesting a virtual dead heat between the two candidates. But it will not be the candidate who wins the most votes that wins this election (as proved to be the case in the controversial 2000 contest and indeed other previous US presidential election contests) but the candidate who wins the most Electoral College votes. Each of the states in the USA (and the District of Columbia) have a certain number of Electoral College votes attached to them, with this number based on the number of Senators (always two) and members of the House of Congress (a function of a state’s population level, but each state has at least one representative) representing the state. As such, the number of Electoral College votes assigned to different states is shaped somewhat by states’ population levels but with a bias towards the states with the smaller population levels as they will always be guaranteed three Electoral College votes. The proportion of Electoral College votes won by candidates in the presidential election does not measure up exactly to their actual share of the first preference vote. The disproportional nature of this electoral system is down to the fact that all the Electoral College votes on offer in a state are assigned to the candidate who wins the most votes in that state on a “winner takes all” basis. In some cases the level of difference/bias can be quite significant where winning candidates’ share of the Electoral College votes have been seen to far exceed their share of the popular vote in a number of past contests – ironically the 2000 contest was probably one of the most proportional contests in this regard. In order to assess how support levels evident in opinion polls might translate into Electoral College vote numbers, I attempt to estimate what the candidates’ first preference votes would be in the different states, assuming similar (proportional) change in party vote shares in all states along the lines of the constituency-level analysis of opinion polls model as covered in a number of posts on the politicalreform.ie website. How does this work? 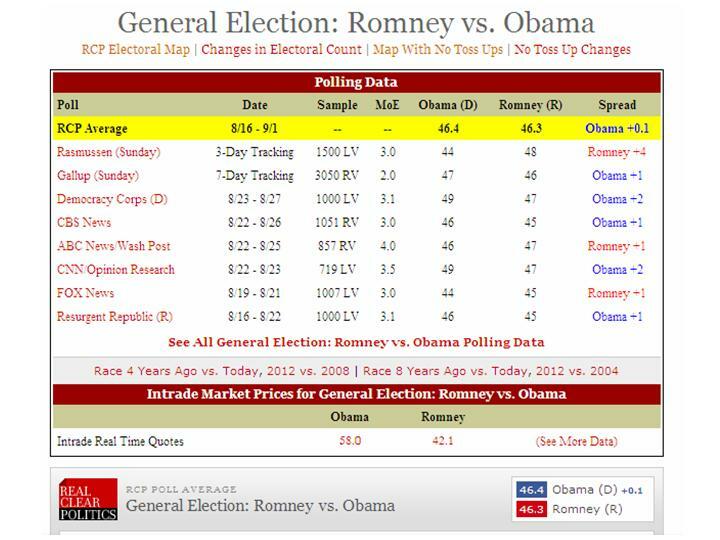 Well, for instance, on the basis of average trends across recent polls (as of 3rd September 2012) which show Obama at 46.4% and Romney at 46.3%, the Barack Obama vote in different states is now estimated to stand at 0.86 times the level of support he won in those states in 2008, while the Romney support levels is estimated to stand at 1.00 times the level of support John McCain won in those states in 2008. This of course is a very rough model, and ignores the fact that changing support levels between elections tend to vary geographically, even within regions. In addition to this, the geography of support for the Republican and Democrat party candidates will in turn be dependent somewhat on the part of the USA that their different candidates hail from – running a presidential candidate from a certain region would probably see an increase the party’s share of the vote in that region – or indeed where their running mates hail from. For instance, the selection of Paul Ryan would be expected to improve the Republican Party prospects of winning his home state of Wisconsin in the election, with Wisconsin being one of the key swing states in this election. Based on this analysis, a very close contest in terms of the national share of the vote, as hinted by the recent opinion poll figures, is likewise expected to produce a very close contest in terms of the number of electoral college votes won by both candidates with the model predicting an Obama victory by just 6 electoral college votes – a roughly similar margin of victory to than won by George W. Bush in the 2000 electoral college vote. It is interesting to note that while national polls are pointing to a close contest between the two candidates, a series of state-level polls in the key swing states, with the exceptions of Indiana and North Carolina, are suggesting that Obama will win these, which goes somewhat against what the model analysis above is predicting, especially with reference to the results in Florida, Ohio and Virginia. This could suggest that a national swing from the Democrats to the Republicans, suggested by a comparison between the national level poll figures and the results of the 2008 Presidential Election, may be translating mainly into larger victories for the Republican candidate in their stronger states, or the “red states”, a factor that could see Romney claim fewer Electoral College votes than would be expected based on the model, or indeed his share of the national vote. Against that, it is worth noting that the extent of the Obama poll lead in a number of the key swing states is very narrow in a number of cases and a small swing in favour of Romney could easily edge these states into his camp. 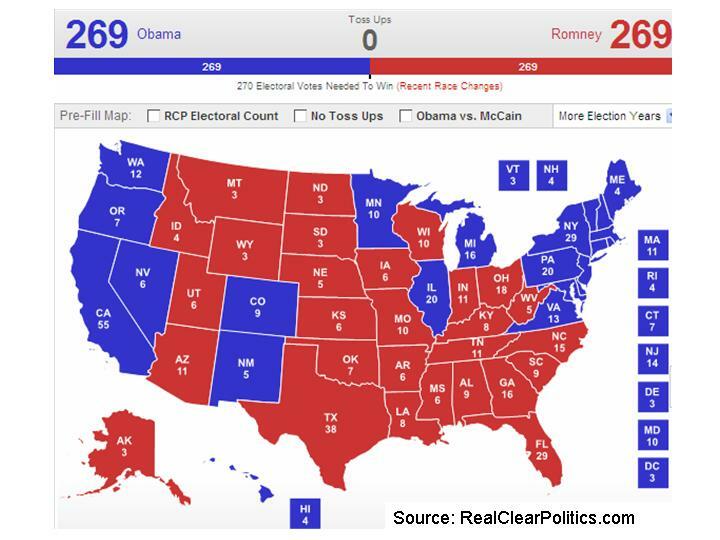 While this analysis suggests an Obama victory in terms of Electoral College vote numbers, the margin of victory predicted is a very narrow one and the Romney camp would be predicted to gain the states of Ohio, Florida, North Carolina, Indiana and Virginia, all of which were won by Obama in the 2008 contest. (A swing towards the Democrats would not result in a similar level of gains for Obama, with probably only Missouri and Montana amounting to potential gains; testament to a large degree in the extent to which he managed to capture his target “swing states” in the 2008 campaign.) In this case, attention would be pointed towards the “next most marginal” states which could ultimately prove to be the crucial battlegrounds in a close contest – Colarado, New Hampshire, Iowa and Minnesota (states where the model predicts the Obama lead over Romney to be less than 3%) as well as Pennsylvania, Nevada and Wisconsin. Romney would then be predicted to win the presidency if he were able to gain a victory in any of these key swing states, which in some cases might require a swing in support involving just a few thousand voters (just over sixteen thousand (16,340) in the case of New Hampshire, meaning that a swing of just over eight thousand votes from Obama to Romney in this state would see Romney take that state and its four electoral college votes and end up winning the presidency by a 270-268 margin). On the basis of the 2008 figures, Wisconsin would appear to be the outside target for the Republican Party amongst this list of states, but the selection of Wisconsin’s Paul Ryan could well produce a “home state” effect in this state that could increase the intensity of a Democrat to Republican swing in Wisconsin and possibly edge this state into the Romney camp in a close contest nationally. If the Republicans were to win Wisconsin, this might raise the prospects of a dead-heat in terms of the Electoral College vote ending as a dead heat. A Republican win in Wisconsin and also in the other swing state of Iowa, accompanied by the Obama camp succeeding in retaining the state of Virginia, would leave both candidates each on 269 electoral college votes if results in the other states panned out in the manner predicted by the model. In this scenario, the presidency would then be decided on by a vote in the House of Representatives, a process that would deliver the presidency to Mitt Romney barring an unlikely series of gains for the Democrats in November’s Congressional elections. This entry was posted in opinion polls, US elections. Bookmark the permalink.